Last week, I shared the "moderate" priced Thanksgiving menu. 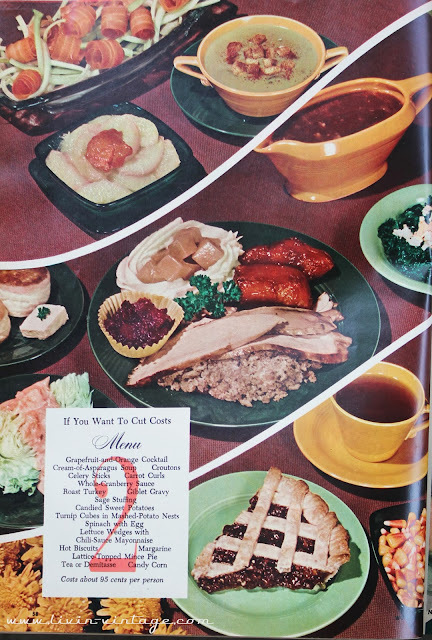 Next up is the "cost cutting" menu as seen in a 1952 Woman's Day magazine. All the menus are built around a traditional turkey roast and gravy. In 1952 this cost about $0.95, which would be about $8.39 in today's money according to an inflation calculator. Stay tunned for the "splurge" menu next week! Also, don't forget to take the etsy shopper survey for a chance to win $25 to Livin' Vintage Shop! Yum, yum, can't wait for Thanksgiving! Forgiveness is the economy of the heart, forgiveness saves the expense of anger, the cost of hatred, the waste of spirits. Visit the link below for more info. Thanks for the post. i'll definitely comeback to read more of your nifty post. Kudos! As we all know that Thanksgiving is all about Food, Watching sport and Get drank....And after see that food menu, I can't hold myself. I just want to jump into that food but thank you so much for this post....Its just amazingly superb. Your new recipe seems to be very unique and delicious. Loved that, awesome delicious looking food. Thanks for sharing such great content with fine writing skills. Keep up the nice work and keep sharing. When is Good Friday 2017 here you can find latest type of good friday images & quotes..
good friday quotes here you can find latest type of good friday images & quotes..
good friday images here you can find latest type of good friday images & quotes..
what is good friday here you can find latest type of good friday images & quotes..